There’s so much to see and do around here! 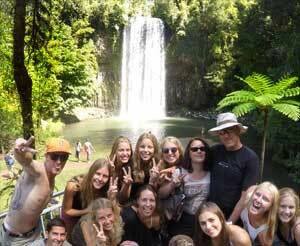 Swim at the waterfalls and walk through the rainforest. Take a relaxing afternoon stroll and visit some of the local specialty shops and cafes around the heritage village of Yungaburra. If you are self driving this is a great little map to show you all the favourite spots – Tablelands Hot Spots Map – so you don’t miss them on your way here!– Our friendly staff are also always happy to help with suggestions! 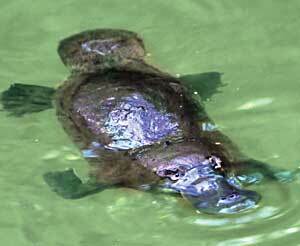 Platypus spotting – see these wonderful creatures at Peterson Creek at dusk and dawn. Our friendly staff will give you a map when you arrive. Swim in the beautiful volcanic crater lake with its deep emerald waters or go for a 3km walk around its perimeter where you may spot a musky rat-kangaroo. Surrounded by World-Heritage Rainforest, this lake is also a great bird watching area.Walk down to the turtle viewing platform and watch for a Boyd’s Forest Dragon, turtles (that breath through their bottom!!!) and the archer fish (known for shooting insects down with water from their specialised mouths). A great place to take a picnic lunch and relax. An easy walk from On the wallaby (approximately 5-7minutes). The best times to view platypus are early morning or at dusk. Go under the bridge and walk along the creek. Be quiet as these creatures are very shy!If you would like a pleasant walk along the track it is approximately 2km (one way). Here you may also see a rare Tree-Kangaroo, ‘Lloyd’s Suspension Bridge’, historical objects and more.Ask the office for a detailed map and don’t forget to take your camera! 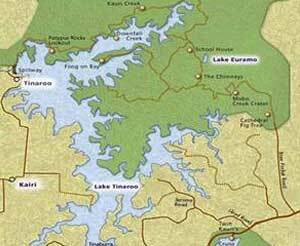 Only a couple of kilometres from Yungaburra is Lake Tinaroo. This is a huge man made lake approximately ¾ the size of Sydney harbour! 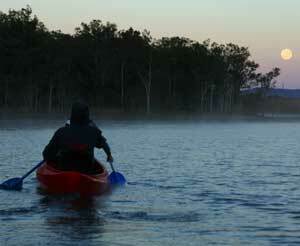 Created by damming the Barron River, Lake Tinaroo was completed in 1958. 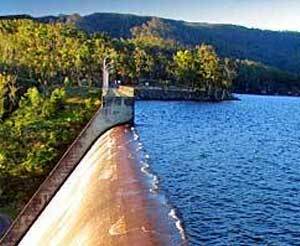 It was the first large dam in Queensland built primarily for irrigation.It is now home to a wide variety of birds and wildlife and is also a fisherman’s paradise! 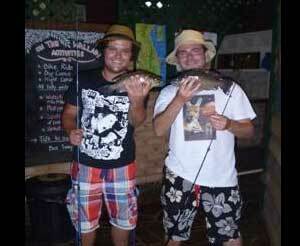 11 World record Barramundi have been caught here along with a world record sooty grunter (black bream). You can hire some fishing gear and a canoe and try your luck on this beautiful lake. Approximately 2 kilometres from Yungaburra this rainforest giant has been wowing visitors for decades. At night it’s also a great spot to look for tree-kangaroos and possums. Torches can be hired from reception. 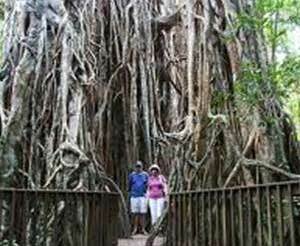 The Cathedral Fig Tree, like the Curtain Fig Tree, is a gigantic 500 year old strangler tree. From Yungaburra head towards Lake Barrine and turn left down Boar Pocket road (approx 15km from Yungaburra). From there its about 5 km. Circumnavigate the base of the tree and giant buttress roots on the easily accessible boardwalk. Unlike the Curtain Fig Tree you can actually walk inside of this tree. Makes for a great photo! This is the larger of the two crater lakes. Enjoy some delicious scones and tea at the Tea House or you can go for a 5km walk along its perimeter through remnant rainforest, there are a few resting spots along the ways with nice views across the lake. If you don’t want to go on a long walk then take a short stroll to the 1,100 year old Twin Kauri Pines.You can also cruise on the lake and enjoy the commentary while viewing sunbathing pythons, duck, eels, and turtles to name a few. Join us for an afternoon paddle on Lake Tinaroo spotting the myriad of birds and wildlife that this beautiful lake has to offer. 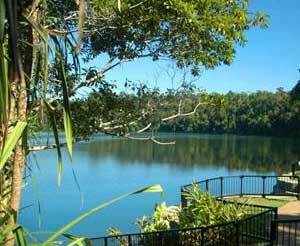 Enjoy a guided morning ride through the picturesque landscape at Lake Eacham followed by a swim in this beautiful volcanic crater lake. Join this a unique and memorable guided tour under the stars. Ideal for spotting nocturnal rainforest animals like flying foxes, pademelons, wallabies, possums, water dragons, platypus and tree kangaroos! Departs 8 pm. A great way to explore the local area is on a bike. Please ask at the office for prices and a good map. 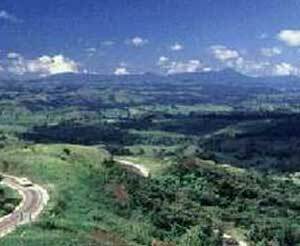 Danbulla Road is a 28 km drive, suitable for conventional vehicles, that runs through the park and forest. 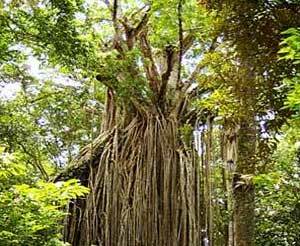 Interesting features including crater lakes, strangler figs, rainforest walks and places of important local history.At least half a day should be set aside to explore this area and a number of walks can also be enjoyed along the way. This is a dirt road so check conditions and take care when driving. Please ask at the office for more information and a detailed map. A gentle 800 meter circuit walk through beautiful rainforest brings you to the site of this geological oddity – a volcanic pipe crater. Pick up a stick in or around the car park before heading in and once there throw it into the crater to give you a clear perspective of how deep the crater is. 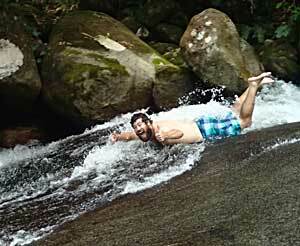 You can also enjoy a swim at Dinner Falls. At an elevation of 1070 meters the Millla Millaa lookout is the most spectacular lookout on the Tablelands. The 1800 lookout allows you to see as far as Atherton and the coast near Innisfail. A must see if the weather is good. The Millaa Millaa Waterfall Circuit is a sealed road that visits three magnificent waterfalls within short distance of each other. Milla Millaa falls, pictured above, is probably the prettiest of the falls, and one of the most photographed images in the Wet Tropics. The other two waterfalls on the circuit are Elinjaa and Zillie. The Milla Milla Tea House at the turn off to the falls is a great place to stop for lunch or afternoon tea. 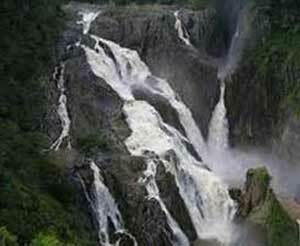 TThe falls can be found 68 kilometres south of Cairns (approx 1 hrs drive) and 20 kilometres north of Innisfail. The road is signposted and its an 8 kilometre drive in to the car park. 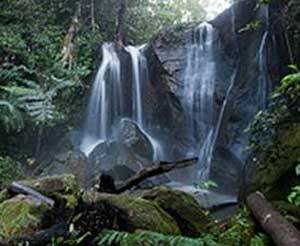 This pretty waterfall is fed by rains falling on Queensland’s highest mountain, Mt Bartle Frere. An 800 metre walking track leads from the car park and through dense rainforest to a viewing platform at the base of the falls. Below the falls are several swimming holes surrounded by boulders and a popular water slide down a smooth sloping rock face between pools. After heavy rains it is often closed to swimming so it’s important to check this. Turn left just after the little township of Walkamin, and then right again into Chewko Rd. The distillery is in a beautiful garden setting in a Macadamia, Avocado and Banana Plantation. Exotic tropical liqueurs to try and buy. Open 7 days 10am to 5pm. If you like coffee then we recommend that you visit the NQ Gold Coffee Plantation (Bruno’s Coffee Tours) – Drive approximately 8 kilometres along the Mareeba Dimbulah road and on the right, look carefully for the sign and turn in. 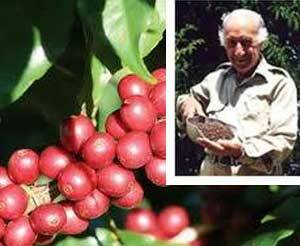 There you will find Bruno and his family working, chatting and drinking coffee. Friendly, genuine and informal. 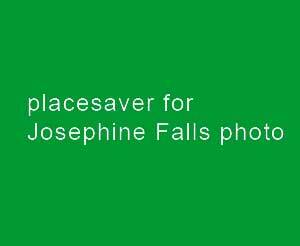 Tours are usually conducted on the hour for just $5. Purchase fresh coffee or coffee beans.Stop off at the Mareeba Information and Heritage Museum to find out further information about other plantations and other things that you can do around Mareeba. Here you will have a fantastic opportunity to get close with the wild rock wallabies in their natural habitat. You can hand feed them with pellets which are available at the entrance. 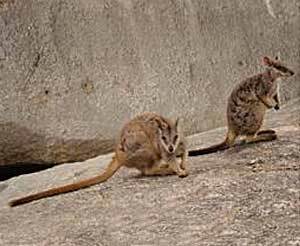 The Mareeba unadorned rock wallabies are rare and endangered and can be seen up close here.Your entry fee into the park is around $7 and includes access to the gorge walks that are designed to suit different capabilities. 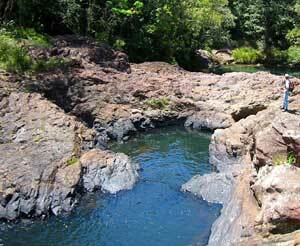 There are also some nice swimming holes here. The Kuranda markets are open every day from 9am to 3pm. Local Art & Crafts – from timber to precious metals, jewellery, fashion garments to puzzles. A wide variety of food & drinks are also available at this village in the rainforest.The Barron Falls walk begins 5 kilometres outside Kuranda. Follow the road signs to Barron Falls. This walk (600 meters) begins with an elevated boardwalk traversing the rainforest just below the canopy. It then winds its way down the hill past several lookout points and rest stops to the lookout area which also acts as a railway platform. 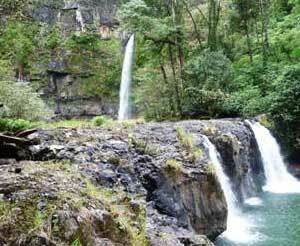 The walk is well maintained, accessible to all, and is a wonderful way to view these huge falls. The volume of water seen in the upper photo only occurs after substantial rainfall during the wet season. For much of the rest of the year, little more than a trickle is evident. 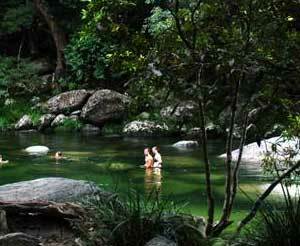 Near Mossman, 80 km north of Cairns is a beautiful swimming spot called Mossman Gorge. Crystal-clear water cascades over large granite boulders. Stroll along the 400 metre river circuit track to viewing platforms over the Mossman River. Take the 2.7 kilometre loop track through lush, green rainforest to learn about the plants and find out how the local Kuku Yalanji people use them in traditional ways. Millstream Falls is 3.5 kilometers south-west of Ravenshoe (approximately 1 hour from Yungaburra) on the Mount Garnet Road. Turn left into the sign posted entrance and follow the one kilometer road to the picnic area.These falls are reputedly the widest single-drop waterfall in Australia. A walking track leads to a viewing area over the falls. 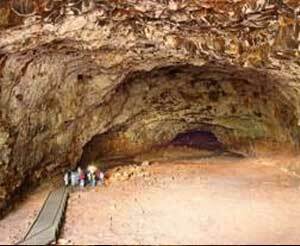 Approximately 2.5 hours drive from Yungaburra is the Undara Volcanic National park that protects one of the largest lava tube systems on earth.Over the years, the ceilings of the tubes have collapsed in many places, allowing vegetation to flourish in the damp interiors. Ribbons of emerald-green vine-thicket, contrasting with the surrounding dry savanna woodland, mark-out the courses of the tubes. You can spend the night at Undara and do a tour of the tubes from there. It is also recommended that you go to the bluff for sunset or sunrise. 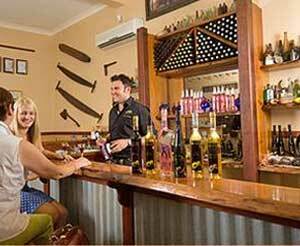 Approximately 3hours drive from Yungaburra is the former mining town of Chillagoe. This little town is a mix of outback landscape, mining heritage, aboriginal art sites and fantastic limestone caves.Today the town is based on tourism. If it’s the mining history that brought you out, head for the museum. Wander through well interpreted sites and don’t forget to include the town cemetery in your walks.Mining is not the only option, and it would a shame to leave without sampling some of the other Chillagoe attractions. Chief amongst them are the substantial systems of limestone caves at the Chillagoe-Montana National Park, about one kilometre from the town. 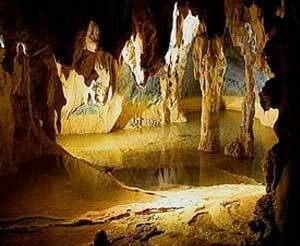 The caves feature spectacular formations of stalactites and stalagmites. 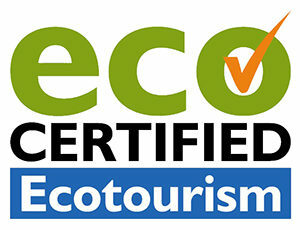 There are tours, which are well managed and very informative. From the caves there’s a walking track to the nearby Balancing Rock formation and some Aboriginal rock art.Mungana is also about 20 kilometers west of Chillagoe and features spectacular limestone caves, small galleries of Aboriginal rock art, jagged limestone outcrops and an historically significant mining site, this park is rich in natural and cultural heritage.The best source of up to date information about tours, sites and walks is The Hub in Chillagoe. Nandroya falls is situated on the Palmerston Highway, midway between Innisfail and Millaa Millaa (approximately 25 kilometres from Millaa Millaa).This is a very picturesque 6.6 km circuit walk. Once at the Henrietta Creek camping area you can cross the footbridge back towards the highway. Walk a short way back along side the highway to reach the start of the track (sign posted). The walk winds about 700 metres into the rainforest before forking to form a circuit.The left hand fork is shorter – about 1.7 kilometres and past Silver Falls to reach Nandroya Falls. The right fork is longer – about 3.5 kilometres and winds along Douglas Creek, offering scenic views of the small gorge and numerous rock pools and rapids of this fast flowing stream.The two routes meet just below the picturesque Nandroya Falls, the perfect place to relax and swim and enjoy the Wet Tropics rainforest before the return journey. Watch out for stinging trees and also leeches in wet weather. 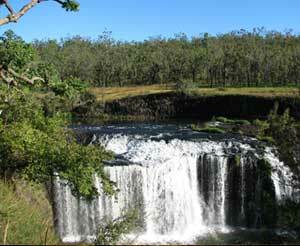 Approximately 6 kilometers from Yungaburra lies a nice short 500 meter circuit walk to Vision Falls. To get there turn off Lake Eacham road down Wright Creek Road. Approximately 800 meters on the right you will see a track that will take you on a picturesque walk to this hidden gem. Ask the office for a map. This easy walk links the Downfall Creek and Kauri Creek camping areas. Listen for the raucous calls of the chowchilla as you pass from native forests into tall pine plantations. This area was used for dairy farming before the dam was built, and was then either left to regenerate or planted with pines. The forest that you now enjoy is the result of a natural revegetation process that has been occurring since 1959. Informative signs along the walk explain how this process occurs as well as what is involved in the establishment of forestry plantations. 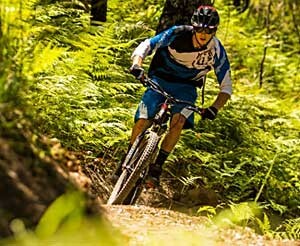 Start this circuit track at the Kauri Creek day-use area. The first part of the walk winds through rainforest along the bank of Kauri Creek. The track then crosses the creek (be prepared to get your feet wet!) and passes through forest before joining an old logging road. You have another chance to dip your toes in the sandy-bottomed Kauri Creek before joining the return track, which is steep and narrow in places and should be undertaken only by fit and experienced walkers. Lake Euramoo is a maar —a dumbbell-shaped volcanic crater formed about 10,000 yrs ago by two massive explosions resulting from super-heating of groundwater. An observation platform affords excellent views of the crystal clear water and the wide array of birdlife. 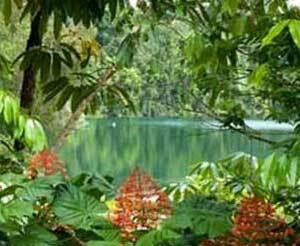 An easy circuit track winds through the rainforest providing occasional glimpses of the lake through the trees. 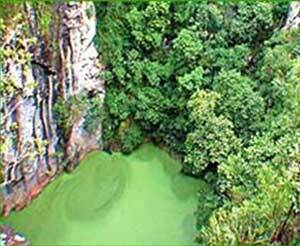 A few kilometres from the eastern end of the road you will find the Mobo Creek Crater. The geology of this crater has perplexed scientists for many years and several theories exist as to how it was formed. You can draw your own conclusions as you enjoy the circuit walk that passes through upland rainforest, following the edge of the crater. Trackside labels help you identify some of the many tree species; quiet visitors may spot a platypus in the creek. 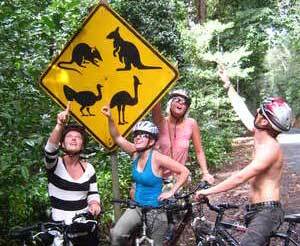 If you don’t have a car don’t worry.. we have some great TOURS from Cairns. 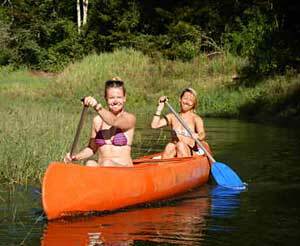 Call On the Wallaby Lodge to book your next adventure! Ph: +61 07 4095 2031.